Fatah leaders award prize to mother of three notorious terrorists from the Palestinian Islamic Jihad who were killed by Israel. 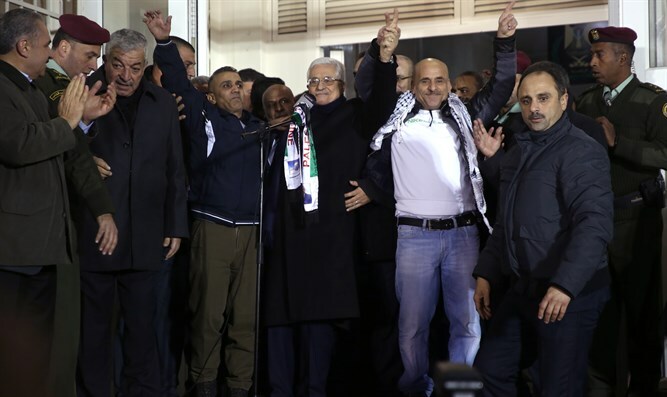 Top members of the Palestinian Authority's (PA) ruling Fatah Party, which Mahmoud Abbas heads, honored the mother of the three terrorists from the Islamic Jihad who were responsible for a series of terror attacks that devastated Israel. A delegation from the Fatah movement in the Gaza Strip, headed by Ahmed Hilas, a member of the movement's central committee, visited the home of Um Ibrahim al-Dahduh, the mother of three senior members of the Islamic Jihad's military wing who were killed during the Second Intifada. Aiyman Dahduh was killed when an Israeli Apache helicopter fired three Hellfire missiles into his car in 2004. Israel killed his brother Mohammed Dahduh by placing a bomb inside his car in 2006. According to a report by the MEMRI Institute, Hilas used the visit to call for "the continuation of their path" and noted "the pioneering role of the al-Dahdouh family in the service of the Palestinian cause and revolution." The Al-Dahdouh family stressed that "they will not hesitate to sacrifice their loved ones for Palestine and Jerusalem," and thanked Hilas for "the honorable gesture that expresses the strength of the connection to Palestine and the loyalty to the martyrs." MEMRI said that the fact that senior members of Fatah were honoring the mother of the notorious terrorists proves that Abbas supports terrorism against Israel. "Awarding a plaque to a mother whose three sons were senior members of the military wing of the Islamic Jihad and who planned and carried out attacks against Israel again points to the support of the Fatah movement, headed by Mahmoud Abbas, for terrorism." "The Fatah movement and senior activists from other factions involved in military activity against Israel."